What Makes a Map a Map? 1. What can maps tell us? 2. How do I read a map? 3. Who made this map? When and why? 4. What choices did the mapmaker make? 5. How do I read beyond the borders of the map? The variety of roles that maps play is astonishing. While one map might provide a simple portrait of place and a record of the contemporary landscape, another will be intentionally designed as a commercial census of the people and resources of a place. Yet another offers a glimpse into the fanciful imagination or the great artistry of the mapmaker. Sometimes a single map offers all these insights at once. To look at a historical map is to step into the past; to look at an old map is also to see the world as it would have been seen by the elites, the government, the military, or the navigators of the day. 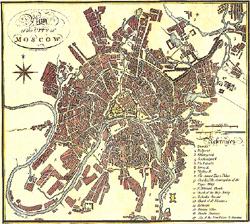 The 1794 map of Moscow below, for example, reveals several interesting historical features: compared with the modern sprawling metropolis, 1794 Moscow appears to be a quite small and compact city; the map shows the remaining inner wall of what was once a heavily fortified city; churches, the names of which constitute most of the map legend, are evidently a key feature of the 1700s Moscow landscape. A fascinating historical exercise might be to follow a sequence of maps of the same city over timedoing so, you can watch the city grow and change before your eyes. But we must always be aware that the view a map offers is partial and particular. Readers often assume that maps are inherently more objective than written narratives. Maps often look as though they are presenting just the facts. A map that shows the cities of Japan in 1790, for example, or a map of the topography of Barbados in 1885, seems to offer little scope for interpretation or subjective manipulation. Either a city is there or not, a mountain is there or not! like all other historical sources, maps can be simply factual but they must also be read carefully as contextualized documents. Maps are made at a particular moment in time by people who are embedded within a social and personal context of hopes, dreams, biases, predilections, and vested interests that can and do influence the map. maps dont just reflect reality, they help to create it. Mapping something gives it an aura of authority and permanencesometimes deserved and sometimes not! As tools for reconstructing the past, to the extent that maps provide records of features, landscape, cities, and places that may not exist any more or that exist in dramatically transformed form. As records of certain historical processes and relationships. Maps of trade routes, for example, if available in a sequence over two or three time periods, will paint a portrait of processes such as the pace of European expansion over the globe. As representations of the worldview of the mapmaking culture, and how that culture saw its place (literally and metaphorically) in the world at the time the map was made.